The highly accurate DST-2420 dynamic wheel balancer ensures an accurate result within hundredths of an ounce, so you can give your clients vibration-free wheel balance every time. We keep your business "rolling." 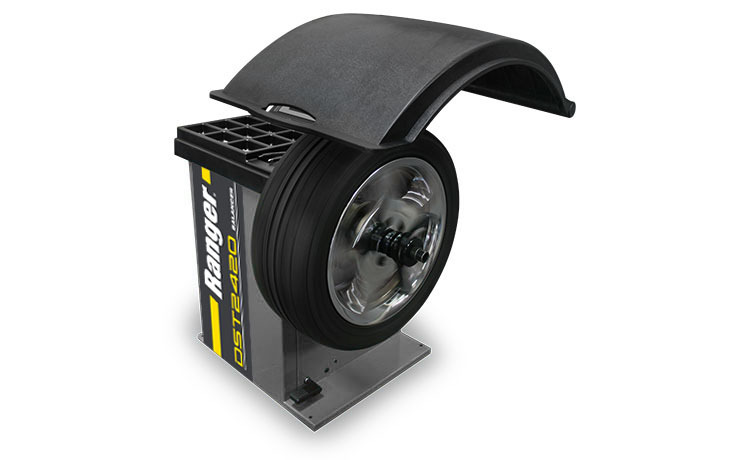 The Ranger DST-2420 wheel balancer handles wheels up to a 30” diameter. It is a highly accurate and dependable no‐frills balancer that features our proprietary Digital Sensor Technology for critical reliability and repeatability. From one-bay shops to high-volume tire stores, the DST-2420 is built with a gritty toughness that puts out perfectly balanced wheels day after day, around the clock. 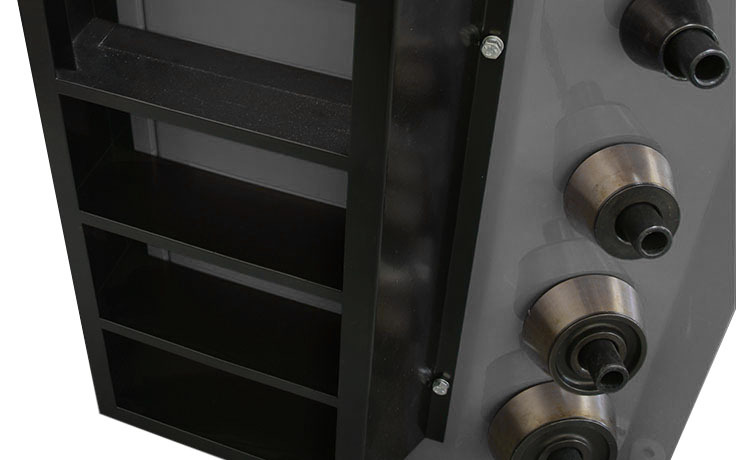 Like all of our DST Series wheel balancers, it’s a zero tolerance performer that features our proven Direct-Axis drive system, accurate to within hundredths of an ounce, ensuring wheels are balanced vibration-free. The DST-2420 automatically calculates the exact weight needed to achieve an optimal balance for almost every tire and wheel configuration on the planet, as well as brightly displayed LEDs that mark the exact amount and location in just six seconds. A full menu of time-saving features, including Dynamic, Static, and Performance Alloy settings, allows you to balance OEM wheel configurations and performance wheels with minimal effort and speed. Our highly accurate Digital Sensor Technology features a 16-digit digital signal processor and single-chip technology that increases productivity and offers unprecedented speed and accuracy—especially when using sophisticated balance and weight placement techniques required for newer high-tech OEM and aftermarket wheels. Single-chip circuit board architecture provides an inherent performance and reliability advantage compared to multi-chip implementations of the same functionality. In addition to overall latency reductions, the single-chip architecture significantly boosts device throughput. An extremely fast and dedicated hyper transport protocol allows data to communicate with the micro-processor at much faster speeds. This solution offers unmatched integration of features and functionality and results in both lower power consumption and dissipated heat. Dual-component piezoelectric quartz load sensors and digital rotation encoder measure longitudinal, transversal and shear effects for multi-directional force unbalance detection. The piezoelectric force sensors are the most sensitive sensors we have ever made, offering superior stability and fatigue resistance for unlimited service life with your wheel balancer. The high-rigidity quartz crystal sensors offer high frequency detection in all three measured directions. The DST-2420 tooling package not only includes our standard car and light truck cones, but a heavy-duty truck cone and spacer ring as well. This well-equipped package includes three automotive and light truck cones: 1.75” - 2.75”, 2.75” - 3.50” and 3.50” - 4.25”, as well as one truck cone 4.50” - 5.00”. 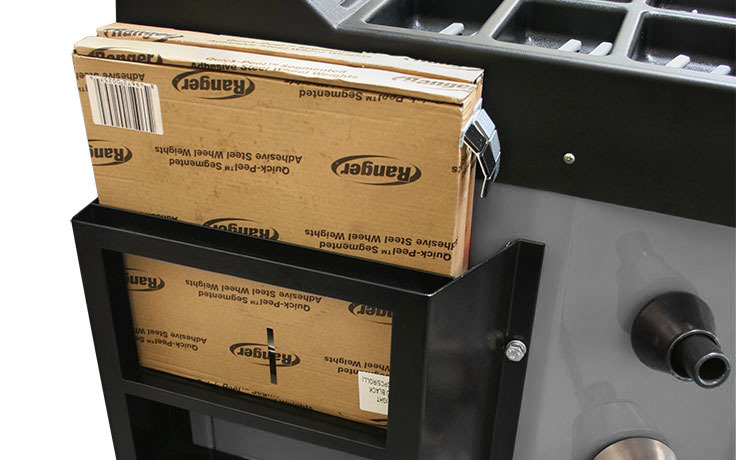 Newly designed side shelf features an open-top design that accommodates Ranger Quick-Peel™ adhesive tape weight. These weights are sold separately in convenient bulk rolls. The DST-2420 automatically calculates the minimum amount of weight needed to achieve an optimal balance for the tire and wheel configuration, so you use less weight. This adds up to real savings and increases your bottom line. 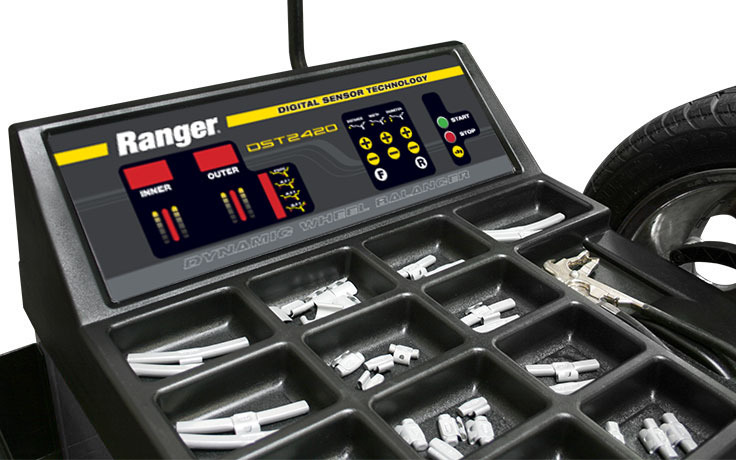 A touch-pad display panel features tire and wheel assembly graphics to help simplify speed entry of wheel data and guide technicians through balancing procedures. Operator function keys are labeled with simple, easy-to-read icons to help operators identify and command all balancing functions. Bright LED weight placement indicators show weight positions as the wheel is gently rolled to exact top-dead-center. Tiered weight placement indicators help identify out-of-sight weight placement such as split-weight or hidden “behind-the-spoke” techniques. Aids with clip-on and tape weight placement at precise locations for zero-on balancing every time. A free kit of wheel weights is included with DST2420 and DST64 wheel balancers. 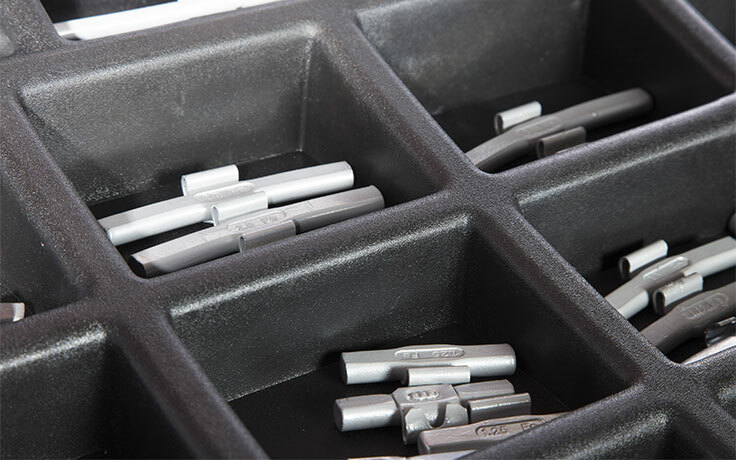 Each unit’s starter kit contains one bulk roll of 100 silver adhesive steel tape weights, one bulk roll of 100 black adhesive steel tape weights and one starter box of mixed clip-on steel weights. It’s our way of getting you off on the right foot. Additional Ranger wheel weights are available for purchase at any time. 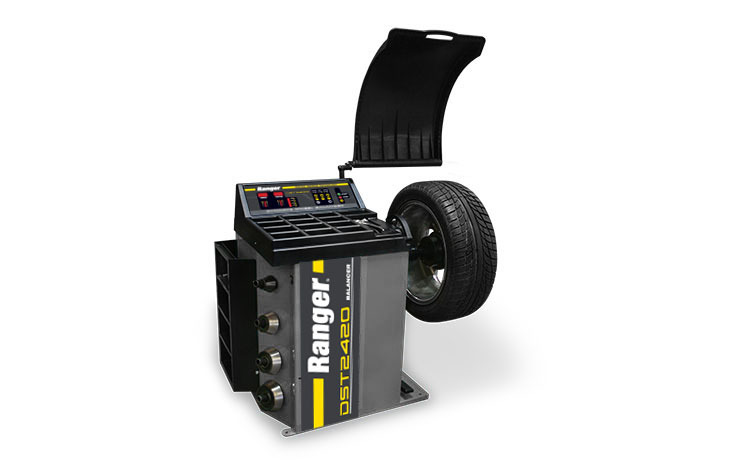 Click the button below to add the Ranger DST-2420 Dynamic Wheel Balancer / 36mm Shaft to your wish list.